Day 7: The Finale is Almost Here! We are less than a day away from the Grand Finale of South Florida Beer Week, The Jupiter Craft Brewers Festival and we have some killer beers to enjoy tonight. Last night we thoroughly enjoyed the onslaught of beer events that hit South Florida and hope everyone had an opportunity to make it out to one of the many events going on. Today we've got some big things too, so there's no time to put your feet up. If you're just finding out, it's too late... The Field of Beers at Roger Dean Stadium in Jupiter will invite foodies and beer folks alike to savor some amazing beer and food pairings. Tickets sold out very quickly but if you know someone with an extra ticket you should definitely try to get your hands on it. Fortunately, if you didn't make it into the Field of Beers, right down the street Das Biergarten in Jupiter will be tapping, dueling firkins from Due South and Tequesta Brewing....Tequesta Papaya Gnarley Barley vs Due South's Saigon Wheat Cask. Who will win? Riverside Market will be hosting a Swamp Head Tap Takeover. Get a little taste of Gainesville right in Fort Lauderdale. Only available in South Florida during SFBW so don't miss out on some delicious brews! Sick of drag racing your Lamborghini on South Beach? Well, why not put the keys down and stop over at Whole Foods for the Kick-off of SoBe Brews Beer Club from 5-7pm. Six Local Craft Brews – Get to know what Florida has to offer $5 Membership Fee. Rest up or power through because tomorrow is the JUPITER CRAFT BREWERS FESTIVAL. We hope to see you out this weekend. And it wouldn't be one of our posts without this friendly reminder: remember this is not including all the amazing week long features at so many great spots around South Florida. It is so easy to walk into a bar/restaurant and drink something local! So make sure you check out our calendar and event guide for all of our weeklong features! So what do we have in store Thursday of South Florida Beer Week? We do it big! With Local Nights, Pub Crawls, Pint Nights, and special keg release just to name a few. We know it has been a long, beer-filled week for you, but just think, we are almost done and then South Florida Beer Week will be gone for a whole year. So put on your beer drinking pants and lets get out there! Back for the second year in a row in honor of South Florida Beer Week, this crawl will bring together four bars in the 1900 block of Downtown Hollywood for a night of great beer and fun. Each bar will feature limited beers from a different Florida brewery, including Funky Buddha Brewery, Cigar City Brewing, Native Brewing Co, Inlet Brewing Company, Due South, and Holy Mackerel. Plus, this crawl has a cause: a $10 donation will go directly to Covenant House Florida, a great organization that provides walk-in services and shelter to at risk and homeless youth under the age of 21. For your donation, crawlers will receive a Drink Like a Local pint glass, special prices at each venue on the crawl for the featured beers, and will be entered into a raffle at the end of the night to win some great prizes courtesy of Brown Distributing. 6:30: Registration begins at Mickey Byrnes (1921 Hollywood Blvd.) courtesy of Covenant House Florida (registration will run until 9pm at this spot). 6:30-7:30 pm: Mickey Byrnes, will feature beers from Due South. 7:30-8:30 pm: The crew moves to Whiskey Tango (1903 Hollywood Blvd) for brews by Native Brewing Co, Holy Mackerel, Cigar City, Due South and Inlet Brewing. 8:30-9:30 pm: The crawl moves to The Greek Joint (1925 Hollywood Blvd.) where Funky Buddha Brewery drafts will be on special. 9:30-10:30 pm: Our final stop is The Tipsy Boar (1906 Harrison St.) for Cigar City Brewing drafts. The raffle and giveaways will begin at 10pm! Tipsy Boar in Hollywood is hosting a Cigar City Tap Takeover, so if you are not doing the pub crawl, swing by for some awesome Cigar City beers. Riverside Market in Fort Lauderdale is hosting a Cigar City night with kegs of Stiftung, White Oak Jai Alai, Sean’s Dunkle, Humidor IPA, English Smoked Imperial Style, and Tocabago Red. Tap 42 in Fort Lauderdale will be tapping a ton of Locally brewed Florida Beers! The Pub in Pembroke Pines is celebrating South Florida Beer Week with a special Funky Buddha Pint Night. Come in for a great local beer and keep the pint while supplies last. World of Beer Dadeland is hosting a Wynwood Brewing Tap Takeover with some great beers including a very special keg! You do not want to miss this! 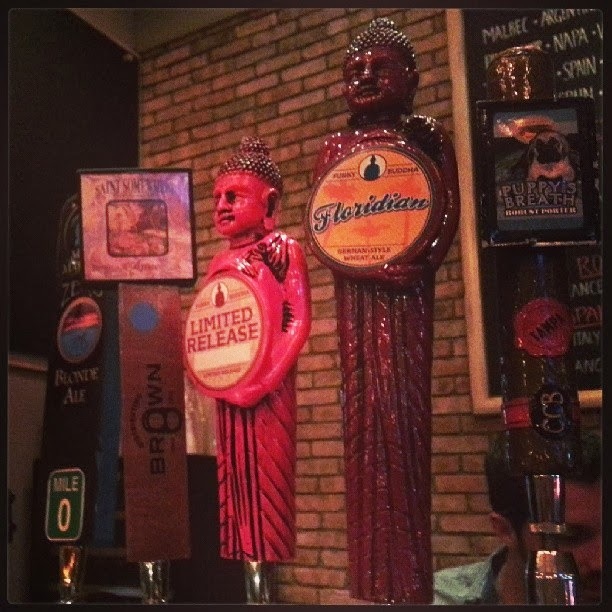 The LoKal in Coconut Grove is tapping a special keg of Funky Buddha Maple Bacon Coffee Porter! Join them for a special release of this one-of-a-kind beer, along with plenty of other goodies from Funky Buddha Brewery! Total Wine and More in Palm Beach Gardens is hosting a Monk in the Trunk Organic Amber and Monk IPA tasting from 4 to 6 p.m.
Das Biergarten in Jupiter is celebrating their 1-year anniversary with a special cask from Cigar City and great beers on tap all night long! Whole Foods Boca is hosting a very special beer tasting in celebration of South Florida Beer Week. For a $10 donation to the Whole Planet Foundation, you will receive a tasting glass and unlimited beer samples along with some special food pairings. There also will be a raffle for some fun beer swag! Total Wine and More in Boynton Beach is doing a Due South Can tasting from 6 to 8 p.m.
Roxy’s Pub in West Palm Beach is tapping a keg of Blue on Black that is a blueberry porter brewed with the winner's of Roxy's Homebrew Competition. It will be tapped only at Due South and Roxy's Pub. The Backyard in Boynton Beach is hosting a Due South Tap Takeover with special beers such as Category 4 IPA, Ginger Snap Imperial Brown Ale, One Night in Ybor, Calling All Cars, Hopoluxo IPA, Asylum Harbor Red, and Roasted Cocoa Stout. Grease Burger Bar in West Palm Beach will be celebrating South Florida Beer Week with a special kegs from Cigar City, Due South, and Funky Buddha! The Funky Buddha Lounge in Boca Raton is going to be celebrating South Florida Beer Week all week long but on Thursday, they will be tapping an amazing collection of their own wood aged beers. Puccini’s Pizza in Delray is hosting Wynwood Tap Takeover with some pretty awesome beers including Pops Porter, Wynwood IPA, El Dorado, La Rubia and more! They also will be serving up some Cuban inspired eats including a Cuban Pizza! And to beat a dead house remember this is not including all the amazing week long features at so many great spots around South Florida. It is so easy to walk into a bar/restaurant and drink something local! So make sure you check out our calendar and event guide for all of our weeklong features! We have made it to Day 5 of South Florida Beer Week and man, it just has been a great week so far, with special keg releases, fun Randalls, and decadent beer dinners. But it isn’t time hang up your mugs yet. We still have lots more to do, people to see, and beers to drink! So what are we going to do tonight? Barracuda Bar and Grill in Coconut Grove is hosting a keep the pint night from 7 to 10 p.m., while supplies last. Come on down and have a pint from Funky Buddha, Due South, or Wynwood and keep the glass! Clandestino's Pub is hosting a very interesting beer talk and local sampling. Come on down and chat about beer while drinking beer! You might learn something new starting at 8:30 p.m. Tap 42 in Fort Lauderdale will be doing a special keg release of Funky Buddha’s Maple Bacon Coffee Porter as well as a special coffee infused “Surf N’ Turf” pairing of sea scallops / short rib and bacon ragu / parmesan polenta / toasted hazelnut vinaigrette. There also will be other great Funky Buddha Brews on tap all night long as well! The keg is going to be tapped at 6 p.m., so don’t miss out! The Mack House in Davie is hosting a dual tap takeover featuring their own Holy Mackerel Brews and Due South Brews. This is as local as it gets folks! Riverside Market in Fort Lauderdale will be hosting the Broward vs. Dade Brew Off! (954 vs. 305): Funky Buddha Floridian vs. Wynwood La Rubia... Funky Buddha Hop Gun vs. Wynwood El Dorado... Funky Buddha OP Porter vs. Wynwood Pop's Porter; 3 on 3, battle of the flights. The Blind Monk in West Palm Beach is celebrating with a pair of awesome new South Florida beers on draft from our friends at Due South Brewing Company. They will be tapping the Citrus Honey Wheat, an American Wheat Beer with orange, lemon, lime, honey, and vanilla, and One Eyed Tiki, a coconut vanilla imperial porter. They also will have plenty of the Cat 3 IPA and UXO American Strong Ale on hand as well. These special kegs will be tapped as soon as The Blind Monk opens at 4 p.m. get there early so you don’t miss out. Total Wine and More in Boynton Beach will be hosting a Inlet Brewing Tasting from 4 to 6 p.m. with samples of Monk in the Trunk Organic Amber Ale and Monk IPA. 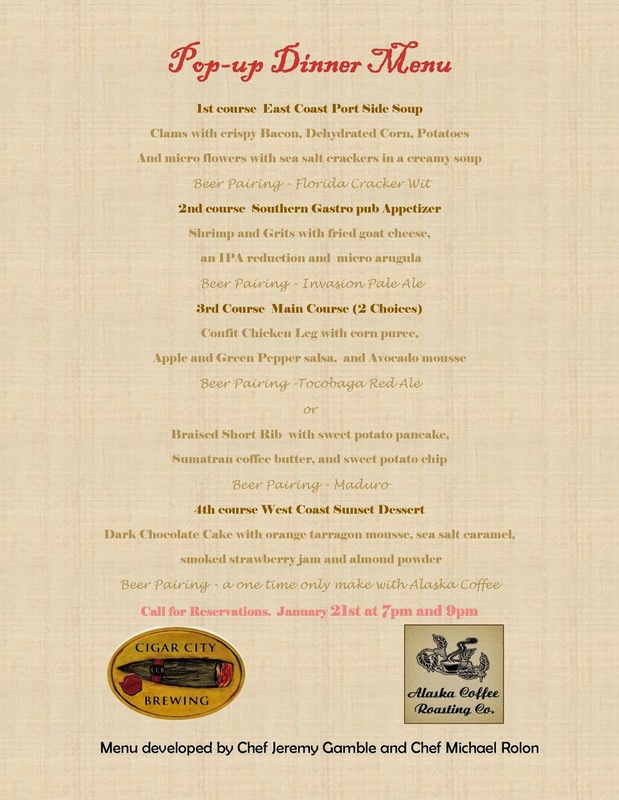 2 Cents in Key West is hosting a very special beer dinner with Cigar City Brewing. It will be a 4-course meal paired with three limited selections from Cigar City and an original 2 Cents cocktail to round out the meal. This dinner is limited to 50 people and is $55 per person. This beer starts as Jai Alai IPA then goes through a treatment on Dried Peaches and White Oak Spirals. The end result is a truly unique IPA with hints of Peach, Tropical Fruit, and hints of Oak. This Black American Lager is a collaboration with Max Lagers from Georgia. This American Black Lag is smokey and roasty, but still thin in body. The final product is then treated on Ash Wood, which leaves a distinct campfire roast flavor. While the beer comes across extra smokey, we did not use any smoked malts in the production of the beer, which makes this one time brew extra unique. This beer starts as Florida Cracker, and then is treated with several pounds of fresh Raspberries, which leads to a pink tint in the color of this beer. Very seasonable beer with hints of wheat, coriander and raspberries. There is a hint of tartness to this beer, so be prepared to pucker up! Don’t forget! This is not including all the amazing week long featurings at so many great spots around South Florida. It is so easy to walk into a bar/restaurant and drink something local! So make sure you check out our calendar and event guide for all of our weeklong features! We have lots going on today for Tuesday, so let’s check it out! Total Wine Fort Lauderdale is hosting a tasting of Native Brewing during South Florida Beer Week including Native Lager and Eleven Brown Ale with Adam the founder of Native! Join us from 4 to 6 p.m.
RIverside Market in Fort Lauderdale is going big for Taco Tuesday. They will be running Cigar City Florida Cracker through a Randall with cilantro and lime to complement your choice of pork, beef, mahi, or chicken tacos. Alaska Coffee Roasters in North Miami is hosting a Pop-Up Dinner with Johnson and Wales and Cigar City. This seasonal four course prix fixe menu is $55 per person with an additional $15 with beer pairings. There will be two seatings, one at 7 p.m. and one at 9 p.m. Call 786-32-4254 to RSVP, there are still some spots left! Wood Tavern in Wynwood is doing a very special can night with 5 different Cigar City cans on special. There also will be some fun beer swag up for grabs as well! World of Beer in Dadeland is tapping a very special keg of Maple Bacon Porter from Funky Buddha along with some other great Funky Buddha Beers tonight! Kill Your Idol in Miami Beach is hosting a very special movie night with a screening of "How Beer Saved the World" and will be doing a local beer sampling and discussion after the movie. Come on down and learn something! Movie starts at 9 p.m.
Total Wine in Palm Beach Gardens is hosting a Due South Can Tasting from 6 to 8 p.m. Hullabaloo in West Palm Beach is hosting a special Due South Beer Dinner. The price is $50 and dinner starts at 6:30pm. Call (561) 833-1033 to reserve your spot. And remember this is not including all the amazing week long featurings at so many great spots around South Florida. It is so easy to walk into a bar/restaurant and drink something local! So make sure you check out our calendar and event guide for all of our weeklong features! Day 3: And it's only MONDAY. It is day three of South Florida Beer Week and the week is just gearing up! 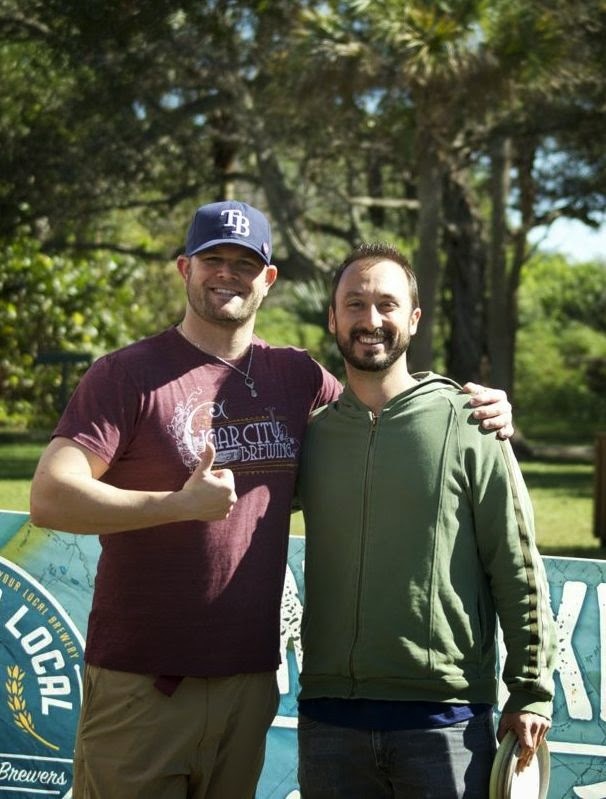 We have had a blast so far with great events such as the Mariana Trench Release at Due South Brewery, the Local Night at OTC and the South Florida Beer Week Disc Golf Classic. You would think because it is Monday, that we would slow down but... NOPE! We are going to start the week off strong and just keep going. Our livers can take a break next week. So what do we have going on today? Let’s find out. 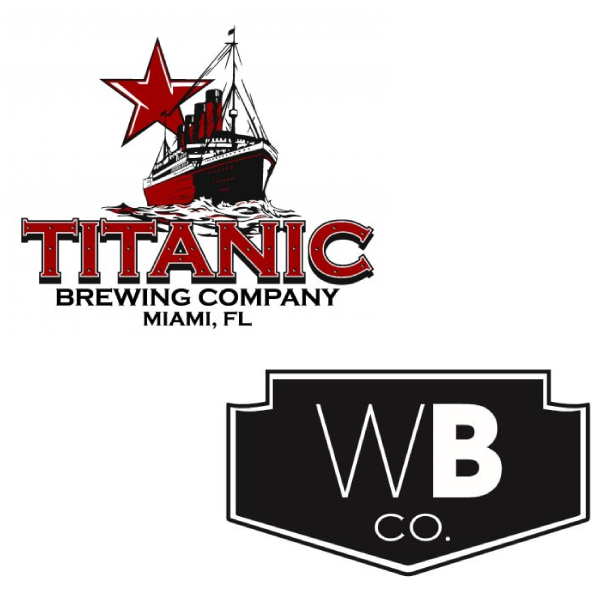 Miami’s Oldest Brewpub, Titanic Brewing Company, is hosting a very special Brewmaster 4-Course dinner and not only are they featuring their amazing brews, but will be featuring beers from Miami’s newest brewery, Wynwood Brewing Company as well. The cost is $50 and there are still seats available! Call 305-667-2537 to RSVP. Forks up at 7 p.m.
Public House in Miami Beach is featuring Wynwood Brewing Company all night long. They will be pouring Pop’s Porter, La Rubia Blonde Ale, Wynwood IPA, and a special release just for the party at Public House – in the form of flights, pints and bottomless drafts. Laser Wolf in Fort Lauderdale is tapping some special kegs from 7venth Sun, Cigar City, St. Somewhere, Funky Buddha and more all night! Make sure you stop by and check it out. Good beer, no jerks! Riverside Market in Fort Lauderdale is putting on some great Due South beers tonight such as Hypoluxo IPA, Caramel Cream Ale, Asylum Red, Ginger Snap, Category 3 IPA, and Roasted Cocoa Stout. Of course this is not including all the amazing week long featurings at so many great spots around South Florida. It is so easy to walk into a bar/restaurant and drink something local! So make sure you check out our calendar and event guide for all of our weeklong features! 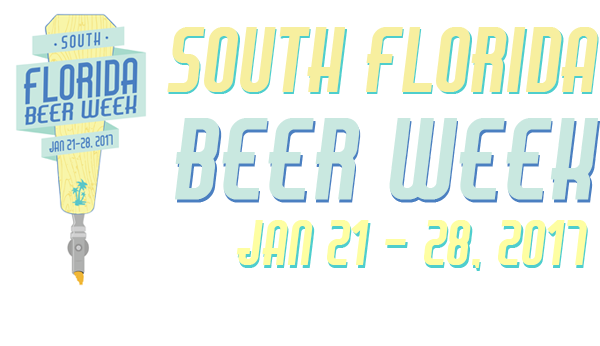 Well it's pretty amazing to see how many establishments have gotten geared up for the 3rd Annual South Florida Beer Week... We are seriously pumped and hope you are too! While looking at the calendar of events, we're confident you're thinking the same thing we are "How am I going to keep track of everything that's going on?" Well - there's one simple answer: This year's South Florida Beer Week Event Guide. 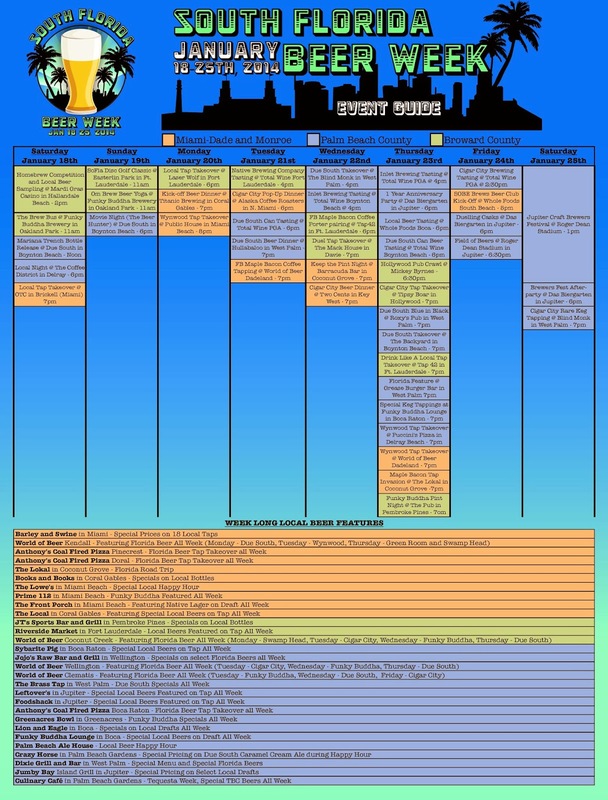 Check out this chart and plot your course for a great week of Florida beer activities! We hope to see you out there! The oldest brewpub in Miami, Titanic Restaurant and Brewery is teaming up with Miami’s newest brewery, Wynwood, in celebrating South Florida Beer Week. This special kick off party on Monday January 20th - 7pm, will be a treat for the foodie in all of us, with a specially prepared 4-course beer dinner. Titanic was founded in 1995 and is a two time medal winner at the Great American Beer Festival for their English style ales. They were doing craft beer in Miami before craft beer was as commonplace as it is today. Wynwood opened their doors for the first time in 2013 and is quickly taking South Florida by storm. Located in the heart of Miami in the up and coming Wynwood neighborhood, they have been in the forefront of the South Florida craft beer movement in Miami since 2011. The cost is $45 per person in advance and $50 the day of the event. Please stop by Titanic or give them a call at 305-668-1742 to RSVP today. Okay Hollywood! Are you ready? We are crawling again! Last year’s pub crawl saw an amazing turnout of over 150 people and we want to do it big this year as well! So let’s get ready to crawl again, on Thursday, January 23 in celebration of the 3rd Annual South Florida Beer Week. This crawl will bring together four bars in the 1900 block of Downtown Hollywood for a night of great beer and fun. Each bar will feature limited beers from a different Florida brewery, including Funky Buddha Brewery, Cigar City Brewing, Native Brewing Co, Inlet Brewing Company, Due South, and Holy Mackerel.